A balance sheet is a statement of a company’s financial position at a particular moment in time. This financial report shows the two sides of a company’s financial situation — what it owns and what it owes. What the company owns, called its assets, is always equal to the combined value of what the company owes, called its liabilities, and the value of its shareholders’ equity. Expressed as an equation, a company’s balance sheets shows assets = liabilities + shareholder value. Generally we run Balance Sheet while closing the Fiscal Year but you can run it monthly, quarterly to stay updated. Select Branch : Please select the branch name if you want to run your Balance Sheet for a single branch. Please select ALL for all branches. If you are a single branch company, name of the company will appear here. No need to select anything. 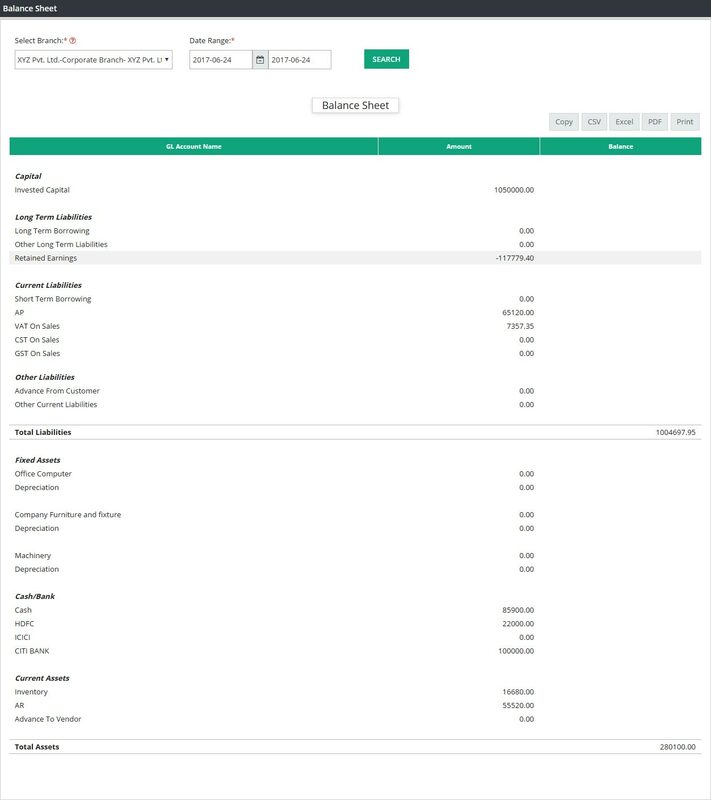 As Of Date : Please select the accounting period for which you are running the Balance Sheet. Like- March 31st 2017. Please click on Submit, Balance Sheet Report will be generated successfully. Balance Sheet will be divided into two parts. Total Assets and Total Liabilities. Total Assets amount and Total Liabilities amount should match. You can copy or save this Balance Sheet report in Excel, CSV or PDF directly from this screen. If you want to print the report, please click on print. Copyright © 2019. Nelso Technology Pvt. Ltd.